The Silverleaf String Quartet was formed in 1997 at the requests of friends and neighbors, and its reputation has grown by word-of-mouth. Comprised of members of the Richmond Symphony Orchestra, the group has been performing ever since for weddings, receptions, corporations, and seasonal and other special events in Richmond, as well as at many other locations outside the metro area. 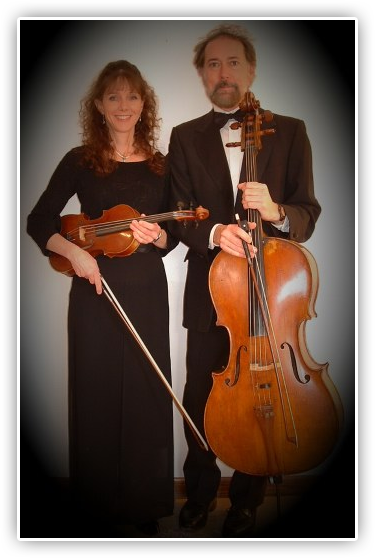 Founders and managers of the quartet are Paul & Susan Bedell. Susan enjoys working with brides and mothers-of-the-brides, and with our combined musical experience and expertise, The Silverleaf String Quartet is a natural and beautiful addition to our life and service to our community. You will find us easy and enjoyable to work with, and will be reassured by our willingness both to be your musical coach, and to fine tune our part in your ceremony. We know the importance of music in a wedding ceremony: that when done well it can shape and give beauty and nobility to the service. We strive to be that element in every wedding we do. Comprised of husband and wife of 30 years, the violin/cello duo takes on a particularly poignant role in a wedding ceremony. Paul and Susan Bedell met in Omaha, Nebraska in 1979 while playing in the Omaha Symphony, spent 5 summers together participating in the Aspen Music Festival, and came east together to play in the Richmond Symphony, where they have been ever since, performing and raising their two daughters. The sound of violin and 'cello is more intimate than that of the string quartet, and is particularly appropriate in smaller spaces.